As an alternative you might want to check out our best buy treadmills page to look for similar treadmills. The Proform XP Weight Loss 620 treadmill is one of the better entry level treadmills from Proform. However, just like any other entry level treadmills, this one also comes with questionable quality. This machine is for people looking for a good entry level treadmill. However, you should not expect too much from this unit. Although it is one of the better entry level treadmills in the market, it is still a budget treadmill and this type of equipment rarely last more than a year without problems. For those who prefer light workouts, then this Proform’s QuietTech™ 1.75 CHP drive motor is a good option. It comes with up to 10mph speed and 10% incline. But due to its cheap parts, I don’t recommend you maximize this machine’s capabilities. Using the Custom Weight Loss Center you can simply put your current weight, the number of calories you want to burn, and how long you want to workout then the machine will automatically customize a program for you so you can reach your goal. The 20” x 55” tread belt is pretty impressive considering this is an entry level treadmill. Not only that, it also features an AirTech™ cushioning which is designed to offer maximum protection and comfort. The 8 customizable iFIT® workouts give you the variety you need to improve your physique. While the Precision QuickSpeed™ control lets you increase the speed of your run through 0.1mph increments. Other features include a Grafixx™ display which allows you to see an animated person running or walking with you throughout your workout and an Interplay™ Universal iPod dock which allows you to plug your iPods directly to the console for entertainment during exercise. As I’ve mentioned above, the biggest fallback of this unit is its quality. It is an entry level treadmill so I don’t think this machine will be problem-free for very long. 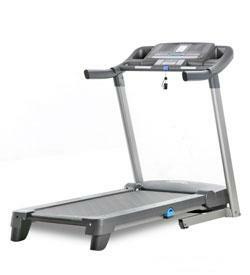 If you plan on buying a Proform XP Weight Loss 620 treadmill , I suggest you buy it at Proform. They offer the best price on the web. You can get it for just $799.99. As an alternative, you can also get one from workoutwarehouse.com or Amazon.com. Since this Proform XP Weight Loss 620 treadmill is discontinued, i suggest you check out the all-new redesign ProForm POWER 995C from these stores - compare and save!